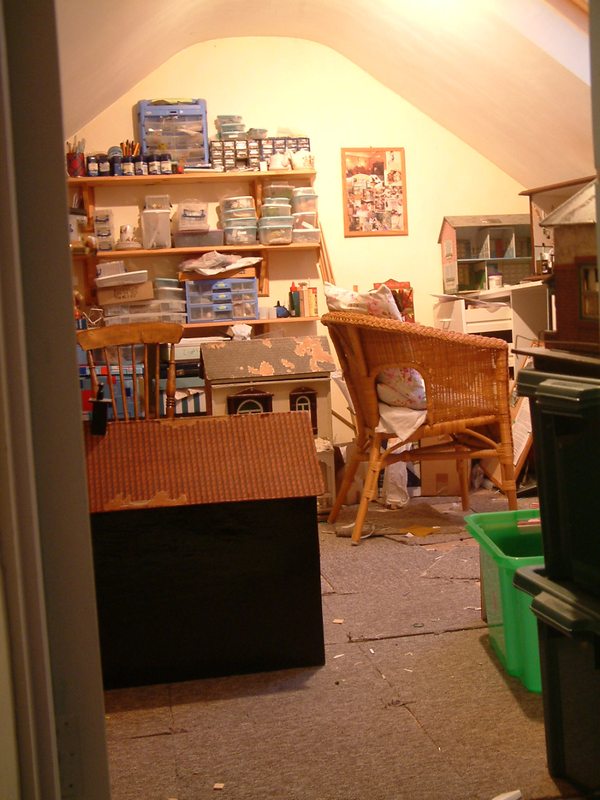 A customer I have known for many years requested recently if I could put a photo or two on here of my workroom. In a moment of madness I promised.....so here we go folks...for better or worse! 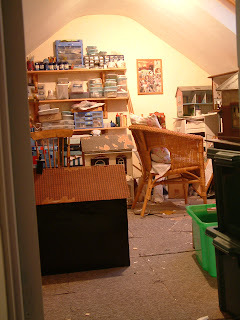 In fact for some reason, on numerous occasions people have enquired about my workroom and visitors who come to the house never ever catch a glimpse of this sacred haven of mine (well not usually anyway) .....as apart from anything else, one has to negotiate two flights of stairs and venture up into the dizzy heights of the house. Then there is a serious question of health and safety.......umm... basically for one’s own health and safety, it is not recommended to set foot in this room! 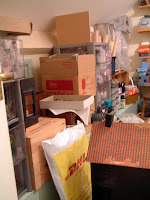 Rarely do I ever see the floor in its entirety and one has to step over or around various boxes, implements, tools, materials of one sort or another plus various old dolls houses in order to get to my workbench. 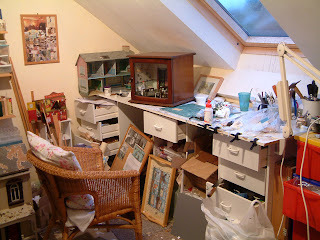 As I constantly have several projects on the go at any one time, I recognise what a muddle my room must look to outsiders. Members of the family who take their life in their hands to bring me up an occasional cup of tea, often can be heard tut tutting about the messy state of my room.....(which is ironic when coming from one's teenage daughter who tutted on the state of my little room the other day...but whose own bedroom makes my workroom look tidy)! 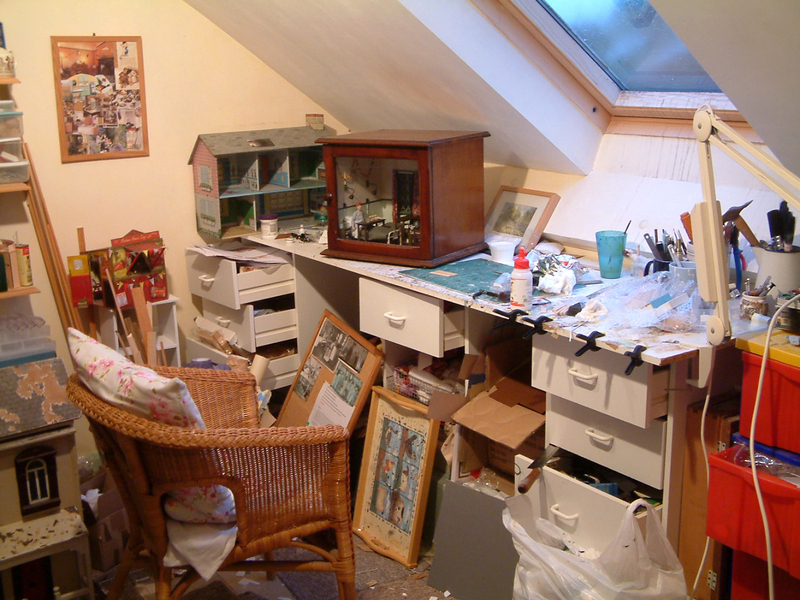 However, I can confidently say that I know where everything is most of the time and work far better in a state of constant mess and mayhem.....as it is organised mess and mayhem. I am sure other colleagues out there may nod in recognition. However the downside is that there is no central heating up there and at this time of year, it can be blooming freezing....so I have to wear socks and several layers of clothes and sing along to Radio Two all day, to keep warm. I occasionaly treat myself to a quick blast from a fan heater when ice forms on the inside of the window but have to be careful due to so many chemicals such as paints, various glues, woodworm killer (for the old dolls houses just in case you are wondering) and varnishes etc. at such close quarters. This is my lovely 1930s bungalow that sits in a corner and which I find utterly inspiring. 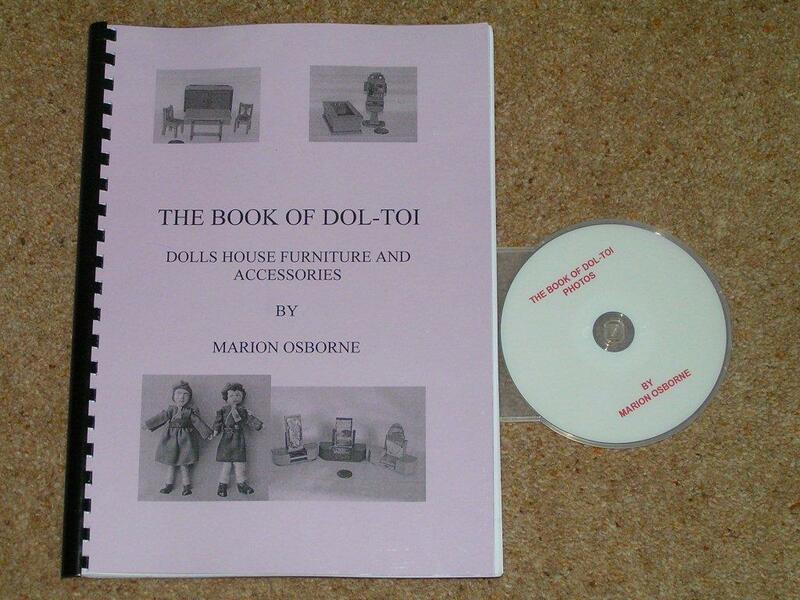 THE BOOK OF DOL-TOI By Marion Osborne has now just been released for sale, covering absolutely everthing from dolls house furniture to accessories that this company sold from 1944 to 1975. FANTASTIC! I for one have eagerly awaited it's publication, like many others and there has never been such a concise book written on Dol-Toi ever! It has taken Marion two years to write, even longer to research and although I have not seen it in the flesh yet, am absolutely sure it will have been well worth the wait. So if you are a serious collector of vintage dolls houses and furniture, this book is for you! There are 217 pages of text, back to back and comb bound, complete with a disc containing over 3,500 photos to illustrate the book. With new technology the print is lovely and crisp and the photos on the disc are clear, in colour and easy to see. However, please take note.....if you do not have access to a computer then Marion warns that this book may not be for you, as you will not be able to access the hundreds of photos on the disc. For full details plus how you can order this book, please go to the Recommended Reading Page on KT Miniatures website CLICK HERE as this book is only available to order directly from Marion herself. For anyone creating a miniature 1930s/40s wartime house or scene, you may find the following video useful and inspiring. I stumbled across it by accident and it gives me goosebumps each time I watch it! 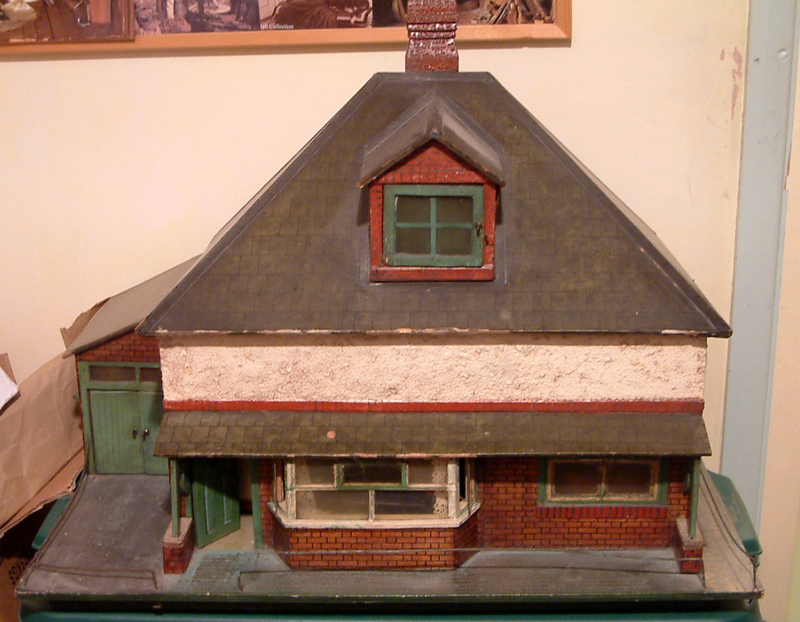 It is of the Piermaster's House as it would have been furnished in wartime Liverpool. Turn your speakers on to soak up the sounds of the era too. The furnishings are fascinating however do ignore the plastic bottle of water sitting on the side in the kitchen (oops...someone slipped up there then)!!!! 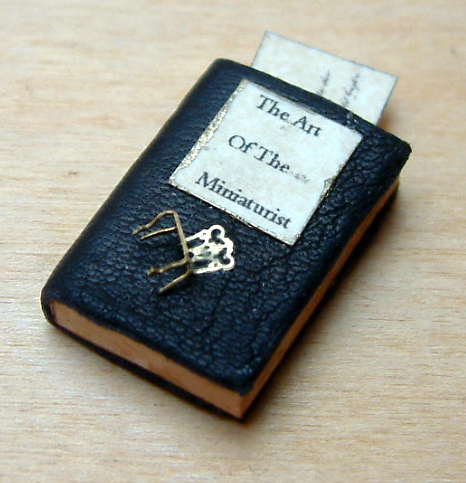 I think its about time I said a "big thank you" to all you lovely people out there who have become followers of this KT Miniatures Journal....hope you are enjoying it and finding it useful? I have to admit to being a reluctant blogger when I first began this KT Miniatures Journal (a few months ago now) and I think it's fair to say that it has taken me a bit of time to get the hang of blogging! Took me about 3 weeks before I dared press the "Followers" button on another blog!!! But is easy once you know isn't it? Well...it is once you know which buttons to press.......and learning about which ones NOT to press! I must add a big thank you too, to those of you who take the time to leave a comment every so often. It is lovely to hear from you. Must admit, when time permits which isn't as often as I would wish, I love to peruse all your lovely blogs out there and although I just couldn't possibly leave a comment every time, I do when I can. 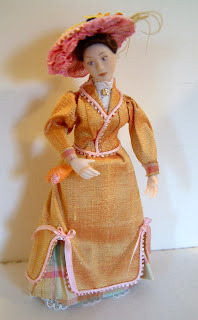 Now I would like to introduce you to some real virgin bloggers.....Felicity and Ron Holland of Ronfel Miniatures. 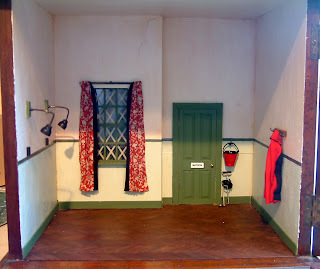 They are the lovely people who so kindly took over Thame Dolls House & Miniatures Fair from me earlier this year and are doing a pretty damn good job organising next years 2011 event. 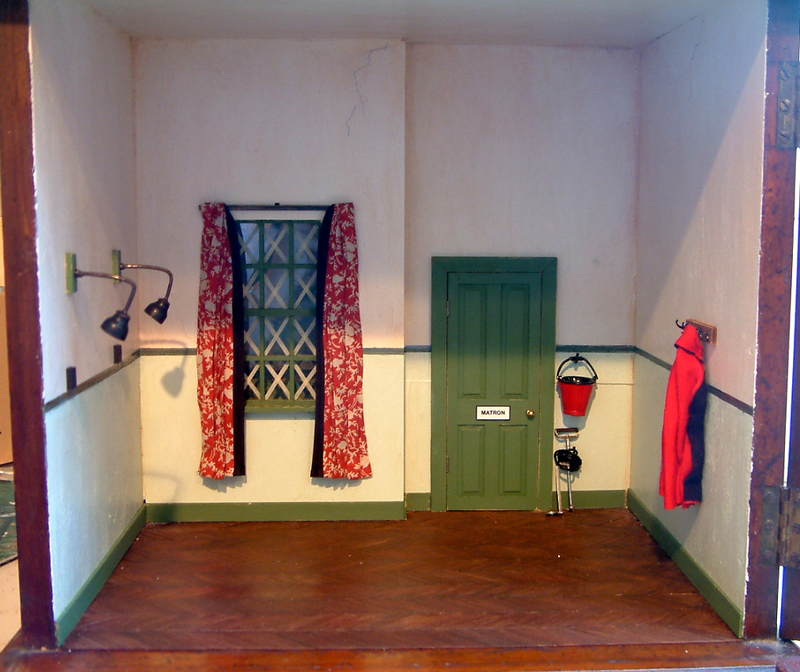 You will be able to keep abreast of up to date news on THE Thame Dolls House & Miniatures Fair on their blog...hot off the press! I am pleased to announce the launch of the Breast Cancer Campaign Raffle Page on KT Miniatures website today, after a slight delay it is now live...HOORAY!!! Visitors to my website this morning were probably wondering what on earth was going on as my Home Page seemed to take on a life of its own but it was only me trying to participate in a spot of web designing all on my very own (oh dear...BIG MISTAKE) resulting inevitably in “mucking it all up” and having to promptly engage the services of hubby to put it back together again! Oh well, its suitably back up and running again now and you can begin to feast your eyes on the goodies that have already been donated to the wonderful Breast Cancer Campaign Raffle that will take place at THE Thame Dolls House & Miniatures Fair on Saturday 19th February 2011. Although I am no longer able to organise this wonderful and special annual event, I have agreed to continue to co-ordinate the Breast Cancer Campaign Raffle and Sales Table. 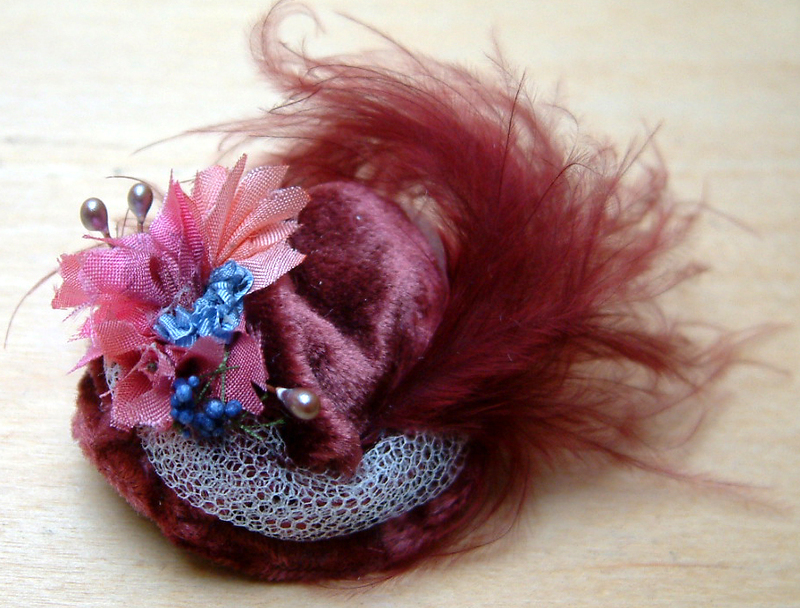 So here we are.....already I have been given donations that are "to die for"..... from not just UK artisans but overseas as well! 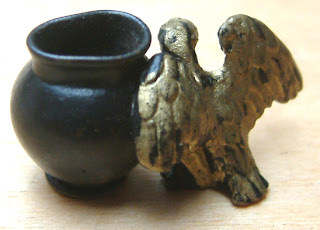 You can see lots more including donations from Australian artisans Kathy Brindle and Lidi Stroud, by clicking onto the Breast Cancer Campaign Raffle Page, either by the following link http://www.ktminiatures.com/Raffle.html or there is a sliding pictorial box link based on KT Miniatures Home Page. More donations will be added as they come in so do keep checking. Here is one of the room box commissions I am currently working on......thought you might like to take a peek as it is quite different from my usual projects. 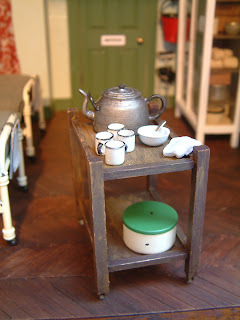 It is a hospital ward scene in wartime Britain during the 1940s....and it will be set at Xmas! The whole scene is being constructed inside an antique cabinet......and is great fun to do although I have to say is proving quite challenging!The whole project is still very much “work in progress” and I will put up more pics when the whole project is complete at the end of this month (I hope). 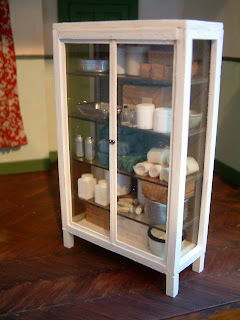 Here is a cabinet filled with medicines, ointment and bandages. 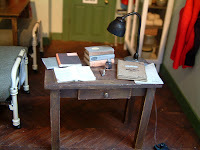 Nurse's desk complete with flex from handmade lamp that will be fixed into a socket on the wall (lamp made from an old Dol-Toi teacup, a vintage metal saucer plus garden wire)! Originally this table was to stand longways but then realised that the lamp flex would trail along the floor...creating health & safety issues...unacceptable even for the 1940s! The tea trolley has a catering size teapot (teapot made by David Williams of Harvington Miniatures) - trolley contents not quite finished yet but it has real working castors so Miss Nurse can wheel this around to her hearts content! 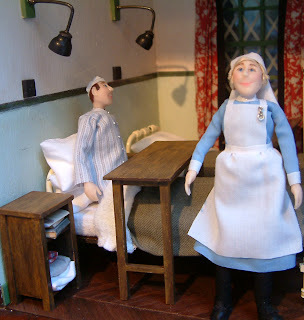 Mr Patient and Miss Nurse are the work of Robin Britton of Coombe Craft, whose fabulous work has been seen before on this blog. 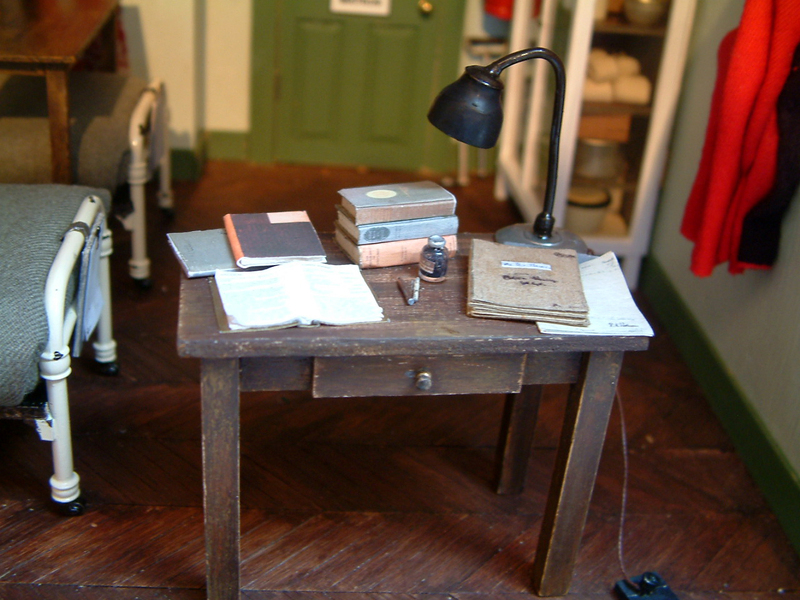 Robin often works closely with me on commissioned projects; her little character dolls are perfect for miniature room settings as they can be manipulated into various positions. More pictures to come when the project is complete.